Hello guys, as you know, I’m Kindson The Genius and I’m always here to keep you up to date with new technologies. Today, we are going to be looking at SAP HANA. My problem with some technologies is that the terms used tend to make the concept look tough whereas it is simply something you already know. 1. 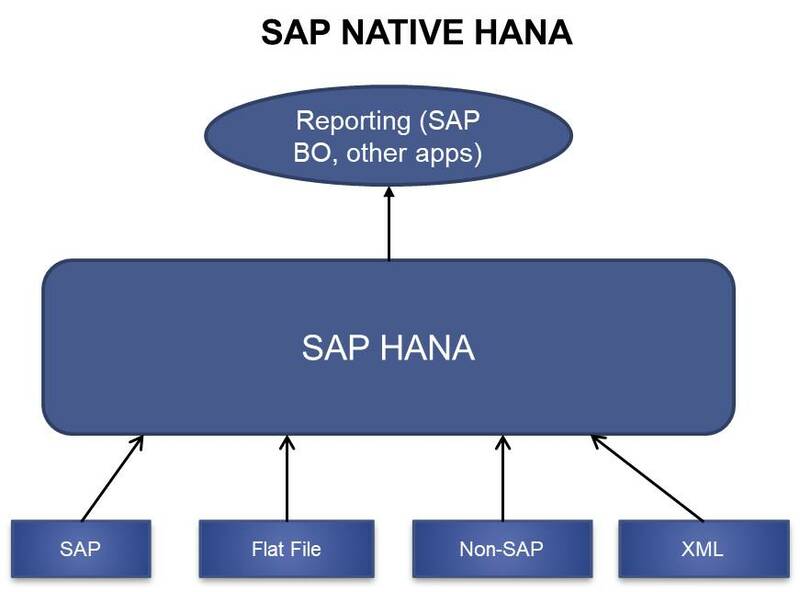 What is SAP HANA? 2. 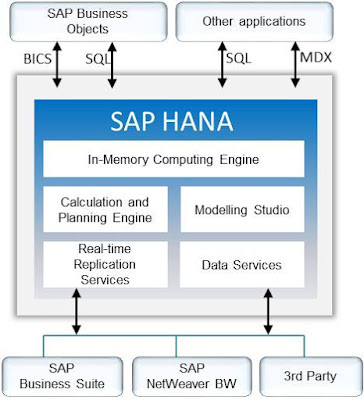 Features of SAP HANA? SAP HANA is defined as ‘a column-oriented in-memory relational database management system developed and managed by SAP’. It is database technology in 2010 but have become very popular over the years. In-Memory Database: this means that most of the data computation are done in-memory as opposed to reading from a database store in a disk. Column Stores: This means that data tables are stored by columns rather than by rows. This method allows for massive compression and data partitioning. Column storage improves performance since as secondary indexed need not be created. We would discuss in later tutorials. Active and Passive storage: Only used the data with is active. You don’t have all the data in memory. For example, only data for the current fiscal year is placed in memory at a time. Real time analysis: This is made possible with SLT (SAP Landscape Transformation). This allows for table-to-table mapping. At the lowest level of the architecture is the various data sources: SAP Business Suite, SAP. 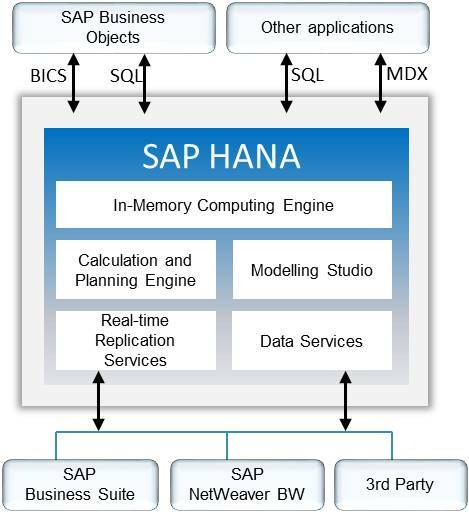 Data comes from these sources into SAP HANA. At the uppermost level is the various tools used for reporting such as the SAP BusinessObjects and other applications. In-Memory Computing Engine and the Calculation and Planning Engine. These are the components that performs the logic. Modelling Studio is used to create data models. Data services is used for data transformation and handling of data between HANA and data sources. The Figure 2 illustrates the difference between the regular database systems and SAP HANA. In regular database systems data is transferred from the database layer to the application layer where the data-intensive logic is performed. And then data is transferred back to the database layer from the application layer. 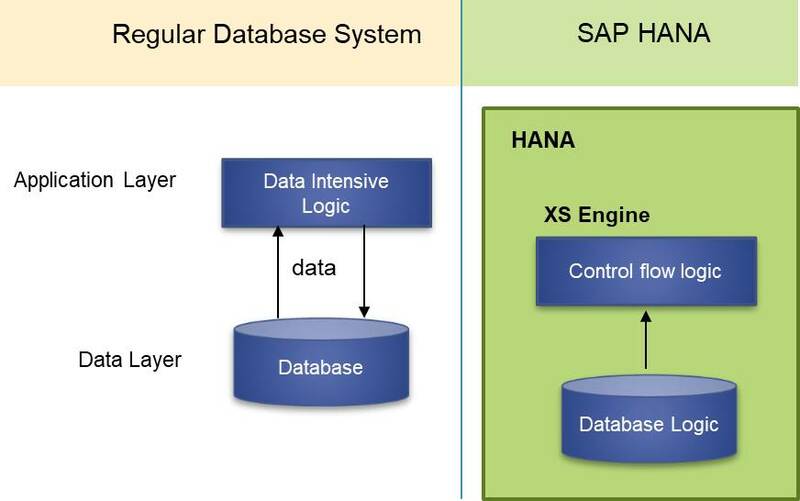 In SAP HANA, we have the XS engine which combines the database and the control flow logic into one single layer. The data-intensive logic is performed in the database and a very light-weight engine, XS(Extra Small or Extended Services) which manages the control flow logic. Non-Native HANA refers to when data intensive logic and the application server logic from SAP HANA are combined with other application servers such as ABAP, .Net and Java. These are located outside of HANA and connect with HANA using open standard interfaces such as ODBC and JDBC. DXC: Direct Extractor connection which uses standard datasources of SAP. In the next we would then dive into SAP HANA using the SAP HANA Studio. Continue to Part 2. Thanks for reading.